Ever try tasty cake with corned beef? Maybe not, I think you probably ask by yourself, what is that? Taste it good? I can assure you this cake is delicious. And if you hate sweet cake, but you like something savory, then is this cake the solution for you. It contains also less sugar than usual cake, which makes this cake low of calorie. This also one of healthy cake with some vegetable such as peas, it's lovely in combination with grated cheese. This is also something different to make with corned beef. Corned beef is really delicious, even scrambled with eggs and baked as an omelet is already delicious side dish for white rice. 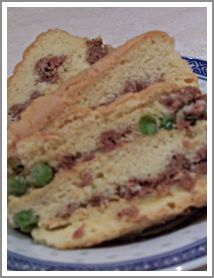 And this cake with corned beef is certainly delightful for as a dessert. But disadvantage of this cake that you can’t too long keep it good, you have to eat up at the same day. Don’t keep it in the fridge or overnight, this kind of cake would be not so good at the next day. Tips: VX, TBM, Cream of tartar are special ingredients to make the cake very nice, soft and rise very well. These stuff can you easily obtain at the big Chinese supermarket. If you go to the samll Chinese supermarket, the chance is small to find these stuff. Another option is, substitute VX by backing powder, this is easy to find at the usual supermarket. And you can buy cream of tartar and Ovalette Special ( TBM ) online. You can't substitute TBM with other stuff, because TBM make the cake very soft and delicious. This is the most important part of the cake. Heat the butter in the pan, add the spring onions. Then add corned beef, peas, grated cheese, salt, pepper, and nutmeg. Fry and stir it until they mixed well. Remove and divide the mixture in 2 parts. Set aside. Preheat the oven at 175 degree Celsius. Mix yellow eggs, white eggs and sugar powder with some salt with the mixer with high speed until you get white mixture, about 15 minutes. While the mixer spin around add pepper, nutmeg, VX, cream of tartar and TBM. Mix again for about 20 minutes. Set the speed of the mixer in the middle then add the cake flour, when the flour already mixed well with the mixture, add the melted butter, mixed well. Turn of the mixer and set aside. Make your bake form ready. Rub the bake form with butter then pour some flour over it, and make sure that all the bottom of the bake form covered by flour, so the cake wouldn’t be stick to the bottom, that’s make easier for you to take the cake out of the form when it’s ready. Add 1/3 of the mixture in the bake form then bake in the oven that you have already preheated for 20 minutes. Take the mixture out of the oven, then pour ½ of the filling, then cover again with 1/3 of the cake mixture. Bake it again for 20 minutes. Take the mixture again out of the oven then pour the rest of the filling, and the cake mixture. Make sure that all the filling covers up by the cake mixture. Bake it again for about 30 minutes or until the cake is ready. Remove and let it cool off for a while before you cut the cake.